My latest crocheted work-in-progress is slow going. About a month ago now, my daughter asked me to make her a new kid sized blanket. We went to the local store where she chose the bright yarns herself. I'm unfortunately bad at finishing blankets or larger crochet projects. I think it might be the repetitiveness of making row after row of the same stitch pattern that drives me a little crazy over long periods. While I know I could finish her blankie in less than a week, it will probably take me another month just because I have to put it down and mix in other projects to break up the monotony. And, if it weren't my daughter who specifically asked for this handmade gift from mommy, I'd honestly much rather be crocheting another cute little amigurumi snowman or quick and easy crochet project of some kind. I looked for a couple weeks trying to find just the right kid's blankie pattern online or in print for her new blanket, but after much debate, I didn't find anything that I really liked. So what else was I to do? Well, make one up of my own of course! That's what I usually end up doing anyway - making up an entirely new crochet pattern or adapting one that I find for free online. I rarely stick to the original! 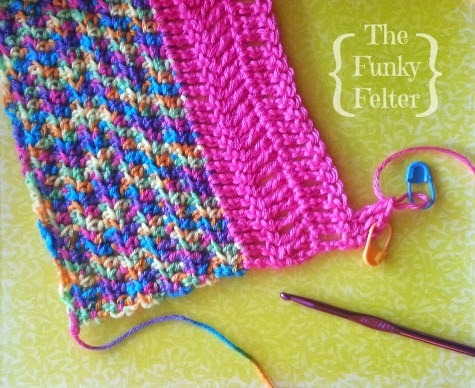 This pattern is basically a simple combination of rows of half double crochets and treble crochets. I also plan to do a nice edging when done with all the rows. 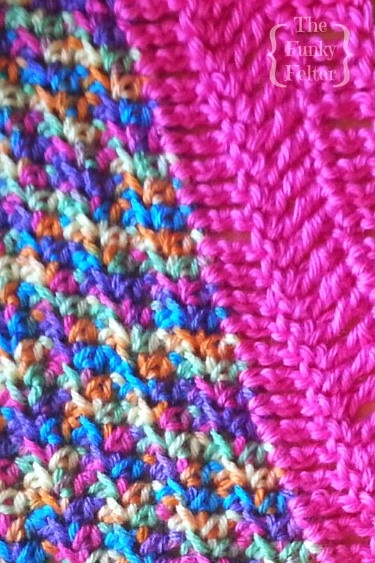 I'm repeating sections of the pretty variegated rainbow yarn with solid colors like the hot pink in the photos. 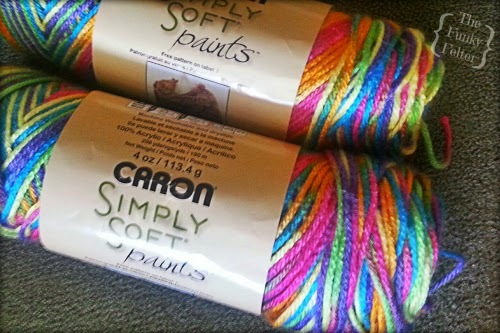 I also plan to use a bright solid yellow and turquoise but we'll see how it goes as I crochet the handmade blanket. I might switch things up along the way. For this crocheted WIP, I'm using Caron's Simply Soft yarn. It is one of my favorite worsted weight yarns for the very soft texture and silky shine of the strand. My daughter chose it though all by herself after picking up several skeins of different brands in the store. She did a great job choosing! I hope she'll learn to crochet, knit or even spin someday. Like my WIP Wednesday crochet project? I have new crochet projects and holiday craft tutorials coming up soon. Be sure to follow me or subscribe to my feed on the sidebar to get those posts. Don't miss out! You can do it! I just started on a bunny hat for Olivia and will do a cat hat for Janet. I'll send pics when done. Thanks for the encouragement Candy :-) I am a serious slow poke when it comes to big projects or repetitive stitching, but I will press on. Can't wait to see your hats! They sound like so much fun.